If u were in a meeting or in a class and you got a message from someone and you had to respond immediately but couldnt respond due to the circumstances, here is the solution to your problem. 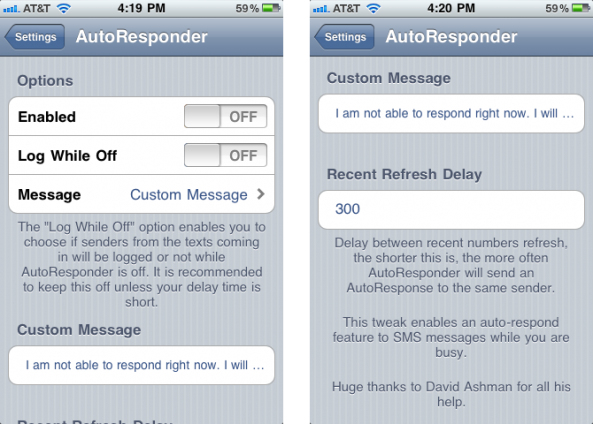 This app will automatically reply to all of your incoming text messages while you are busy doing something important. Auto Responder will essentially act same as your voice message system. It will respond to your text messages with a response which you might have saved or select the existing one “ I am in a meeting “ or “I am driving”. You can get this App from the Cydia App Store. This app is available only with Cydia so this means that you need to have a jailbroken iPhone. This App cannot be seen as an icon on your screen, instead you will have to go to Settings on your iPhone screen and scroll down until you come across the auto responder option. 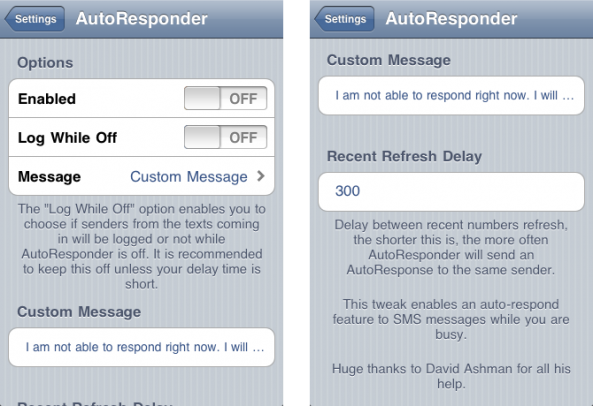 Message: This message lets you type a Custom Message to be sent to your contacts when you receive a message.